Program activities require compliance with various environmental laws including: NEPA; CEQA; Endangered Species Act of 1973 (ESA); Clean Water Act; Wild and Scenic Rivers Act; Executive Orders 11988 for fl oodplain management, 11990 for protection of wetlands, 13112 for invasive species, and 12898 for environmental justice. When working on public lands managed by the U.S. Forest Service (USFS) or BLM, the projects must meet additional guidelines (e.g., stipulations of the Northwest Forest Plan and the Aquatic Conservation Strategy). Since construction of its fi rst gravel augmentation project in 2003 and channel rehabilitation project in 2005, the Program has worked to standardize its environmental compliance methods for these activities. Specifi cally, Program staff worked with the California Regional Water Quality Control Board North Coast Region (RWQCB) to complete a Programmatic EIR (Master EIR) and Environmental Assessment (EA). The Master EIR will serve to streamline future CEQA, NEPA, and permitting activities. Implementation permits require the Program to perform a variety of monitoring tasks and to report the results. A long-term monitoring plan is being developed to evaluate if any loss of riparian vegetation or wetlands are occurring as a result of the channel work. 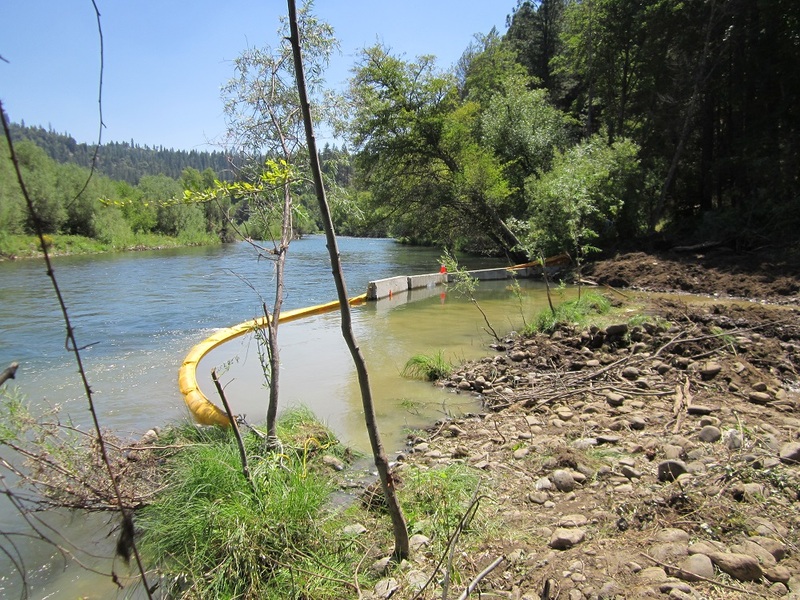 Environmental permitting for TRRP rehabilitation sites, and for earlier bridge modifications, generally requires 1:1 replacement of riparian vegetation types as classified by the California’s Wildlife Habitat Relationships (WHR) over a 10 year period. Vegetation replacement is expected to come from both plantings and natural regeneration in roughly equal amounts. TRRP monitors vegetation recovery and at a 5-year mark, assesses the likelihood of achieving the 10 year goal. Given the competing rehabilitation needs for removing vegetation from low-water banks, TRRP’s site designs attempt to encourage vegetation regrowth on floodplains, essentially moving the riparian vegetation a little back from the river’s low-water edge. TRRP actions fall under the ‘no net loss’ requirements for wetlands as delineated by the U.S. Army Corps of Engineers. Wetland restoration and enhancement is a frequent component of TRRP rehabilitation actions. Therefore, restoration is likely to actually increase the extent of wetlands along the river. Bullfrogs are an invasive species from the eastern side of North America, and are aggressive predators that can wipe out native amphibian populations. Therefore, wetlands constructed or enhanced by TRRP are generally designed either to dry up over the summer (which kills bullfrog tadpoles while native frogs metamorphose and move elsewhere), or to connect with the river during high flows (which allows fish into the wetlands that can consume bullfrog tadpoles). Turbidity, a measure of the cloudiness of water, is typically low in the Trinity River during low flows. Permits require avoiding increased turbidity while implementing restoration actions like gravel augmentation or mechanical channel rehabilitation. Monitoring turbidity during gravel placement showed little impact on water clarity during spring high flows of up to 4,500 cfs. Also, monitoring during construction of the Sawmill site indicated that work adjacent to the channel in the riparian areas also did not affect turbidity, except for a short period during berm and turbidity curtain removal. Innovative control techniques were developed to keep turbidity impacts low. Turbidity mitigation measures are used during the Bucktail channel rehabilitation project. Salmon require cold water. Spring water temperatures in the Trinity River are important for smolts, while summer and fall temperatures are particularly important for adults. Water temperatures in the Trinity and Lower Klamath River are monitored to understand how well the dam releases met expected water temperature criteria (the 2009 report and others are available in our online library). Meeting these objectives generally requires flows of 450 cfs from Lewiston Dam from the end of the ROD restoration flow release through October 15th. Possible affects of the volume of Trinity Lake and water transit time through Lewiston Lake are under investigation. Further information on water temperature is found in our temperature-related Science page.